Headbutt – Headbutt is a full round action (but can be also executed if wendigo rushes you). Dmg 5d10+14, can only be used on huge or larger creatures. Huge creatures save vs Rod/Staff/Wand or get knocked down. They also save vs Paralyze or become stunned for 1d10 rounds. Gigantic creatures save vs Paralyze or become stunned for 1d4 rounds. Sharp Claws – Wenigo’s claws will sever a limb on large or smaller creatures on a natural 20. – ALL wounds regenerate 3 hp EACH every round. – non physical damage regenerates 1 hp pr. turn. If Wendigo is ever killed, he will be reborn in 100 years as long as there are trolls left in the world. Safe fall: Wendigo can jump down 200m without taking damage. From 201-400m he takes half dmg (10d6 dmg). Beyond 401m, he takes full dmg (20d6 dmg). 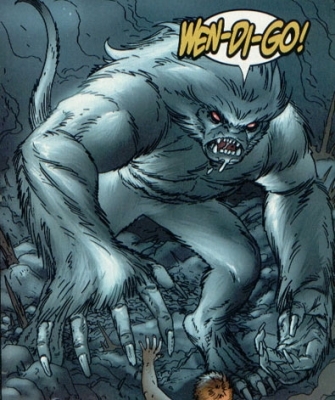 Track: Wendigo can track prey by scent like a ranger, with 75% accuracy. He will always pursue an unfamiliar scent.